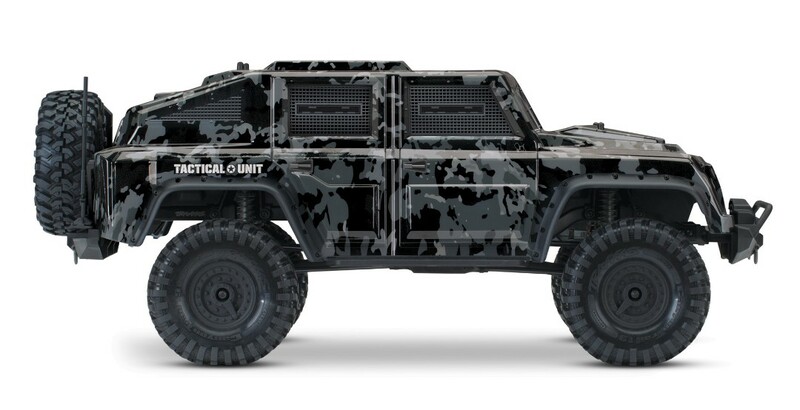 Lightweight Night-Camo Body: The Tactical Unit’s lightweight night-camo body lowers the overall center of gravity (CG) of the truck for greater speeds, tighter handling, and improved technical crawling. The steep approach angles and high center ground clearance provide an unstoppable combination to conquer any terrain. 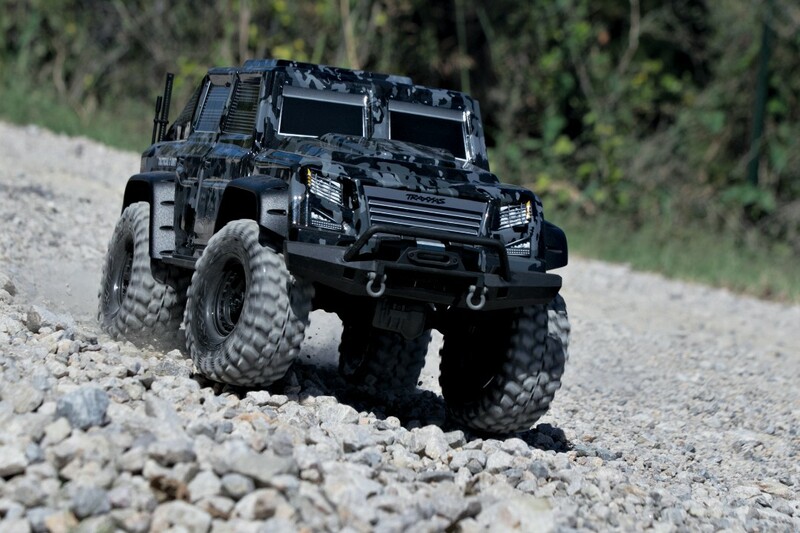 Ultimate Ground Clearance: The TRX-4 Tactical Unit is equipped right out of the box with Traxxas’ game-changing portal axle set. Portal axles lift the truck at the wheels for huge center pumpkin ground clearance. In order to achieve the same clearance with straight axles (and not get stuck), your tires would have to be over an inch taller than the TRX-4’s tires. 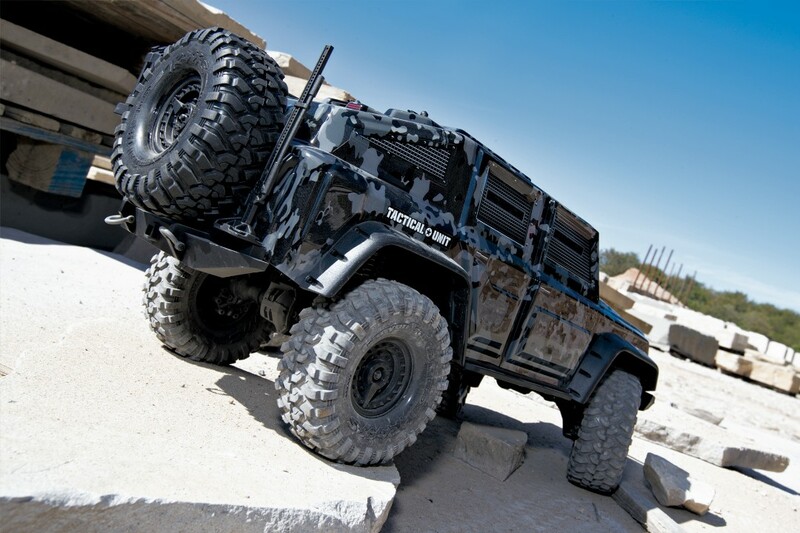 Straddling boulders with ease, the TRX-4 chassis leaves all the others behind. Torque Twist Eliminated: The portal axles use gear reduction right at the wheels to dramatically reduce undesirable torque twist. Total axle gear reduction is over twice non-portal designs. The Titan 550 motor’s torque translates into straight, powerful, forward motion, rather than wasted energy twisting your rig right off the rocks. Remote Locking Differentials: Traxxas gives you the versatility to lock and unlock the front and rear differentials to suit your driving needs directly from your transmitter. Leave the differentials unlocked for relaxed driving on the trail with smooth, tight turning and better handling at high speeds. When the trail gets technical, lock the front and rear differentials, or just the front, for superior grip over extreme terrain. Sleeved micro cables control the differential action for scale appearance, without limiting the huge suspension articulation. Hi/Low Range Transmission: When the going gets tough, use your transmitter to shift into low range for incredible 4-wheel drive pulling torque. Shift into high range for blasting down the trail. The plush suspension design absorbs rough terrain with ease and delivers outstanding scale appearance. 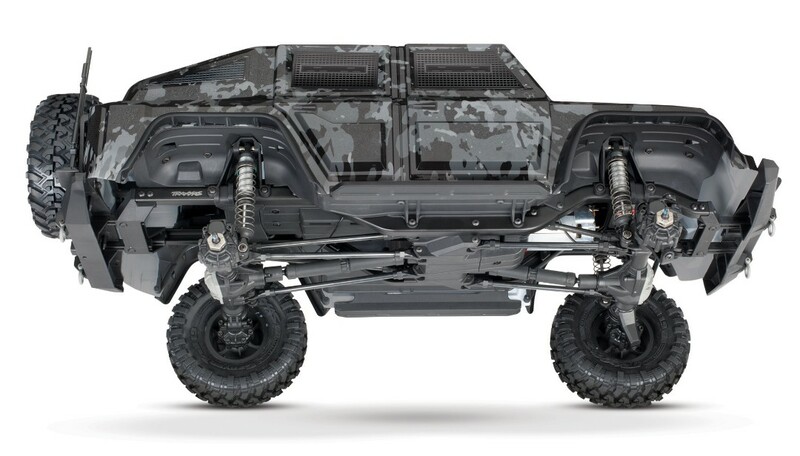 Unmatched versatility makes the TRX-4 Tactical Unit adaptable to just about any situation or driving style. 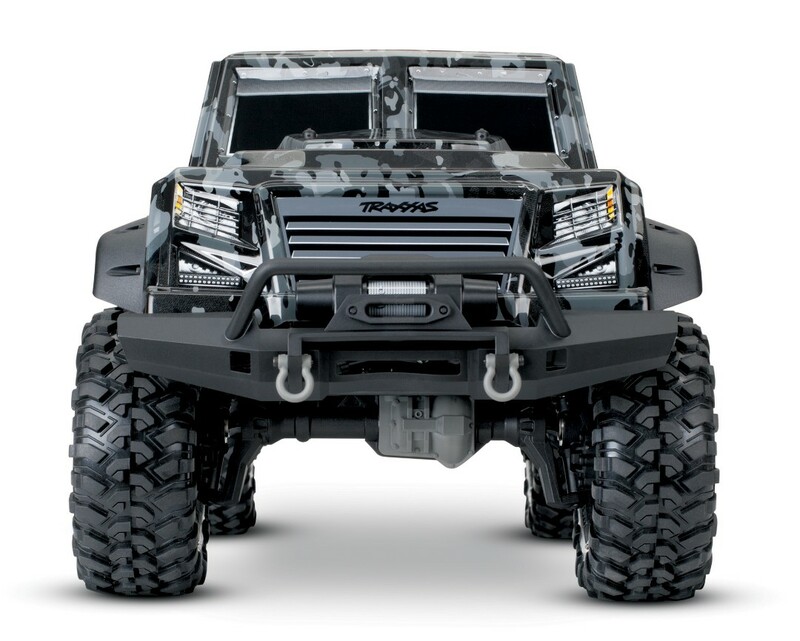 Waterproof: Traxxas was the first to bring you fully waterproof RC vehicles years ago with our innovative designs. The TRX-4 Tactical Unit is fully waterproof for how you like to really play, not “splash resistant.” There is a big difference. Traxxas’ patented innovation gives you the freedom to tackle creeks, snow, and mud without worrying about water in your electronics. 3S Power System: The XL-5 HV electronic speed control brings 3S LiPo capability for stronger, more efficient running. New speed control profiles have been added for smooth and precise control. A new Trail profile facilitates smooth driving for most of your adventures, while the Crawl profile introduces hill hold and instant reverse for extremely technical courses. Either will help you navigate obstacles with ease, right from the start. 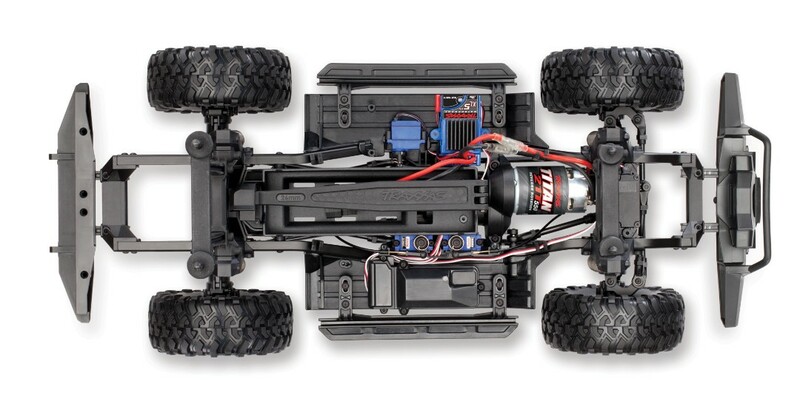 Long run times, up to 2 hours, are possible with a Traxxas 3S 5000mAh iD LiPo battery pack! Aluminum GTS Shocks: Oil-filled coil-over GTS shocks were created exclusively for the TRX-4 chassis. These silver-anodized aluminum units deliver silky-smooth damping performance and feature threaded shock bodies for easy ride height adjustments. The convincing scale realism looks great and they perform even better with an O-ring cap seal and dual X-ring shaft seals.